Sister Therese Maureen Colavechio, I.H.M. 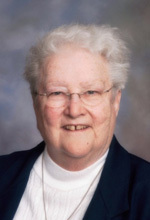 Sister Therese Maureen Colavechio, I.H.M., died April 24 in Camilla Hall, Immaculata, in the 64th year of her religious life. She was 81 years old. Born in Philadelphia, Sister Therese entered the Congregation of the Sisters, Servants of the Immaculate Heart of Mary in 1951 from St. Gabriel Parish, Philadelphia, and professed her vows in 1954. She taught in the elementary and secondary schools in the Archdiocese of Philadelphia and the Dioceses of Harrisburg and Arlington. She taught and assisted at Bishop Shanahan High School, Downingtown, for 28 years. The funeral Mass was celebrated at Camilla Hall on April 29. Norbertine Father Richard J. Antonucci was the celebrant and Msgr. Joseph Logrip was the homilist. Concelebrants were Norbertine Father Theodore J. Antry and Fathers Peter J. DiMaria, Raymond W. Smart, Matthew Guckin, James Melle, Laurence Gleason and William E. Dean. Deacon Eugene Favinger assisted at the altar. Sister Therese is survived by members of her I.H.M. community, her brother, Norbertine Father Xavier Colavechio, her sister, Sister Regina Fidelis, I.H.M., and her loving nieces, grandniece and grandnephew. Sister Therese was predeceased by her parents Archibald and Catherine McCrosson Colavechio; her brothers, Thomas Colavechio (Nancy) and Father Francis Colavechio; and her niece, Mary Ellen Colavechio.